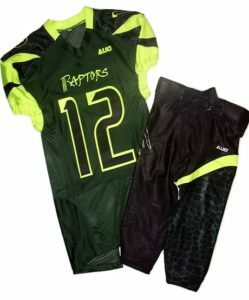 When you take the field in our full compression uniform set your team will be letting the competition know that you’re a serious team and highly competative. Our full compression sublimated jersey jersey gives you the performance you want with srategically placed mesh panels for breathability. Matched with our spandex/lycra pants that are available in pad pocket or full pad integrated, you’re ready for action. Team name, logo, player names and numbers are all included in the base price.